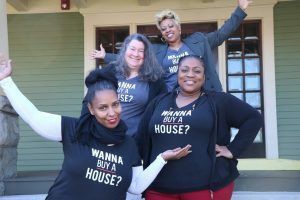 Portland Community Reinvestment Initiatives Inc. · Credit - Portland Community Reinvestment Initiatives Inc.
Are you looking for the best deals on a car? Cell phone? House? Loan? Join PCRI’s financial education program May 31 for a credit building class that covers the ABCs of credit and includes insider tips on how to build credit, even rebuilding badly damaged credit. Understanding your credit is an important step to ensure you get the best bang for your buck. When: Wednesday, May 31, 2017 – 6:00 p.m. to 7:30 p.m.
Due to limited seating please RSVP to Marqueesha Merriweather at (503) 288-2923 ext. 102 or by email. Click the photo at right for a downloadable flyer. Interested in more information about PCRI’s financial education or homeownership programs? Learn more HERE. Homeownership welcome sessions are held twice per month and additional classes will be offered each month; please check back for more information. UPDATE 12/14: Seminar has been rescheduled due to winter weather conditions. This seminar will now be held on Tuesday, December 20. Are you looking for the best deals on a car? Cell phone? House? Loan? 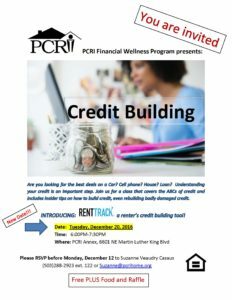 Join PCRI’s financial education program December 14 for a credit building class that covers a renter’s credit building tool, the ABCs of credit and includes insider tips on how to build credit, even rebuilding badly damaged credit. Understanding your credit is an important step to ensure you get the best bang for your buck. When: Tuesday, December 20, 2016 – 6:00 p.m. to 7:30 p.m.
Due to limited seating please RSVP to Suzanne Veaudry Casaus at (503) 288-2923 ext. 122 or by email. Click the photo at right for a downloadable flyer. Interested in more information about PCRI’s financial education or homeownership programs? Learn more HERE. Additional classes will be offered each month; please check back for more information. Spending and credit habits can be easily tested during the holiday season: from temptation to overspend on those perfect gifts to discounts offered to open a store credit card. So it seemed to be a good time to revisit some tips shared at PCRI’s October financial education seminar. Myth: To get a high score, run up high balances on your credit cards. Reality: Using lot of credit is usually NOT good for your credit risk score. Roughly 30% of a FICO score is determined by a person’s reported debt, with particular emphasis on utilization of revolving credit such as credit cards (utilization = balance divided by credit limit). A rule of thumb is that people with high credit stores typically keep their utilization under 25% on credit cards. Myth: Paying your credit card bill down to zero every month will boost your score. Reality: Paying off your credit card is a great habit! You’ll avoid spending money on interest and likely keep your credit usage in the “good” zone. But … this great habit doesn’t necessarily translate into a higher credit score because scoring agencies generally see the balance as of a particular date, not how much is paid each month. Myth: To raise your score quickly, open a new credit card or take out a loan. Reality: The FICO score considers a wide variety of information about each reported account. A propensity to open new accounts and a short history on new accounts will likely hurt one’s credit more than help it. But if you take on new credit only as needed and use it responsibly, negative impacts of the new account will generally be offset within a few months. Myth: To raise your score quickly, close any unused credit cards. 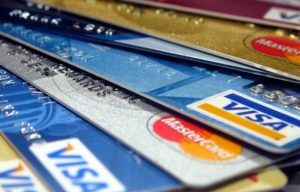 Reality: While it might seem like closing a credit card would help one’s credit score, that’s rarely the case. Having unused or available credit is more often viewed as a sign of lower risk for creditors. 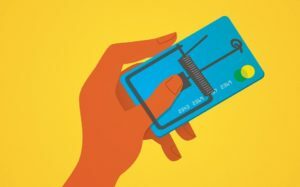 And although closing a credit card might be a worthwhile tactic so you don’t have the temptation to spend money you don’t yet have, it likely won’t boost your score (and might actually hurt it). So what are the factors that determine a FICO credit score? Of course, these are just tips and recommendations. Your credit score considers deeper and more complex factors that just these few bullet points. Luckily, we can help. Join one of our upcoming financial education seminars or call us at (503) 288-2923 to make an appointment to meet with us one-on-one. For anyone who has applied for a credit card, a personal loan, or insurance: there’s a file about you. This file is known as your credit report. Credit reporting companies sell the information in your report to landlords, creditors, insurers, employers and other businesses with a legitimate need for it. They then use this information to evaluate your applications for a car or home loan, credit card, or even an apartment lease. Having a good credit report means it will be easier for you to get loans and access lower interest rates. 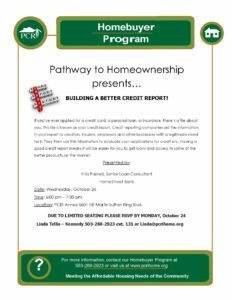 Join PCRI and Kriss Parnell, Senior Loan Consultant at HomeStreet Bank, for this seminar which will help you better understand what goes into a credit report, how it can impact you, and what you can do to improve your report. Interested in more information about PCRI’s homeownership programs? Learn more HERE. Additional classes will be offered each month; please check back for more information. For more information contact Linda Tellis-Kennedy at (503) 288-2923 or by email. Click the photo at right for a downloadable flyer. 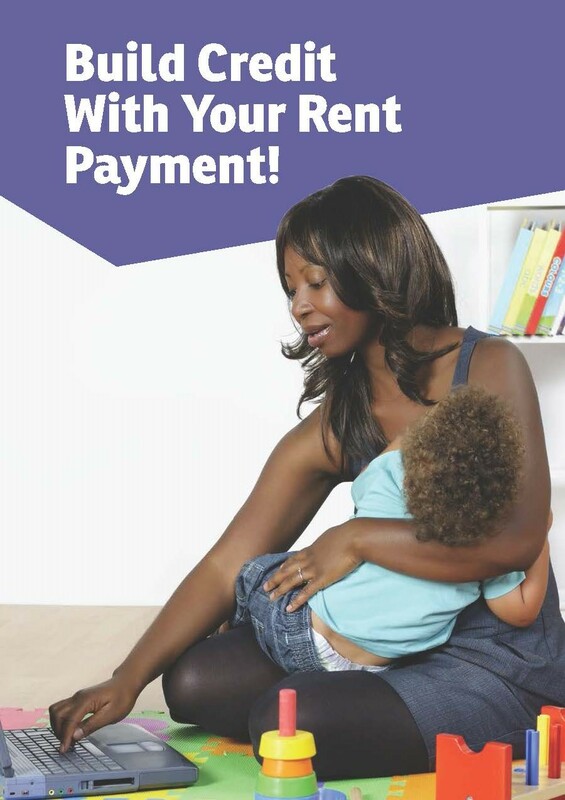 Since Spring 2015, PCRI residents have been able to participate in automatic online rent payments which also help build credit. Residents enrolled in the online program (also called Automated Clearing House, or ACH), have already seen an average increase in credit scores of over 37 points, and some have increased credit scores of 50 points or more. Enrolling in the program is a simple and easy to start building or improving credit. Benefits of higher credit scores include reduced interest rates for loans, improved readiness for homeownership and more. To learn more, contact PCRI’s office at 503-288-2923. For residents who are interested in the convenience of autopay, but are not interested in building credit, PCRI has an alternate payment option. Please contact us for more information. Are you getting calls from collection agencies and you don’t know what to do? Do you want to clean up your credit so that you can achieve your goal of homeownership? 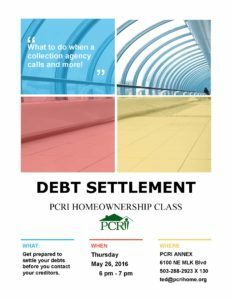 On May 26, Portland Community Reinvestment Initiatives will host a debt settlement workshop that will give you the answers you need. This Homebuyer Education class is designed to help residents in any part of the credit spectrum with answers you need to reduce debt and improve credit. The hour-long class will help you get prepared to settle your debts before contacting your creditors (and hopefully before they contact you). Interested in more information about PCRI’s homeownership programs? Learn more HERE. Additional classes will be offered each month and new public resources will soon be available; please check back for more information. 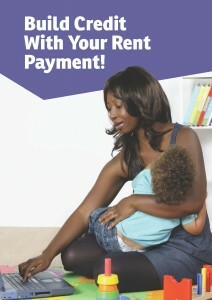 For more information contact Homeownership Program Coordinator Ted Salter at (503) 288-2923 ext. 130 or ted@pcrihome.org. Click the photo at right for a downloadable flyer. After working with PCRI, participants will know more about the process of home buying and be prepared to begin the journey towards becoming a homeowner! PCRI is excited to begin the second series of the “Money Smart” Financial Education Program in partnership with Banner Bank. Residents who complete the four-class program will earn $100 to open a new checking account. The program includes four 2-hour classes on Tuesday evenings, starting Tuesday, October 6, and will cover topics ranging from budgeting, balancing a checkbook, managing credit and avoiding identity theft. 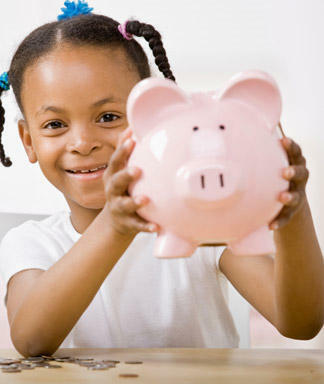 Class 1 (Tuesday, October 6, 6-8 p.m.): “Bank on It” and “Borrowing Basics” topics include basics of banking and borrowing. Class 2 (Tuesday, October 13, 6-8 p.m.): “Check it Out” and “Money Matters” topics include backing vs. check cashing services, and budgeting. Class 4 (Tuesday, October 27, 6-8 p.m.): “To Your Credit” and “Charge it Right” topics include financial scams, identity theft, and maintaining good credit. Participants who attend and complete all four classes will earn $100 from Banner Bank. Class sizes are limited and registration is required. Contact Amy Dang, PCRI’s Financial Education Specialist, for more information or to register. All classes will be held at the PCRI Annex, two blocks north of PCRI’s main office.